year also and gave some of their demands. Thanks a lot for the team members for there time and effort. Venue: Poonjery Govt Hr Secondary School, Poonjery Village,Thirukalukundram Taluk, Kancheepuram district. Total no of Beneficiary : 200 students of +1 and +2. All of You are invited to join with us. 1 pm: Distribution of Indiasudar Career Guidance Booklets. We had wonderful meeting with the project leads and Udhay for about 6 hours. 1. We worked on how to make school smarter and come up with the program calendar for complete next year. Mission: Adopting a govt. school and making them Smart in terms of education, rich in culture, moral values, health and support them based on their requirements. Dec – Jan – Tips and suggestions on "How to score good marks in exams"
Week end classes and learning centre as usual. 2. We are planning to implement above in almost five govt schools. We need almost 50 volunteers to conduct summer camp. If anyone is interested please inform me well in ahead. And also your interest too. In case if anyone is interested to train volunteers on any specific arts, please let me know well in advance. Wish You on India Sudar Day !! Wish you Very Happy India Sudar Day !! Thanks for your Selfless, Dedicated and Honest service to Create powerful India through education as a Team. 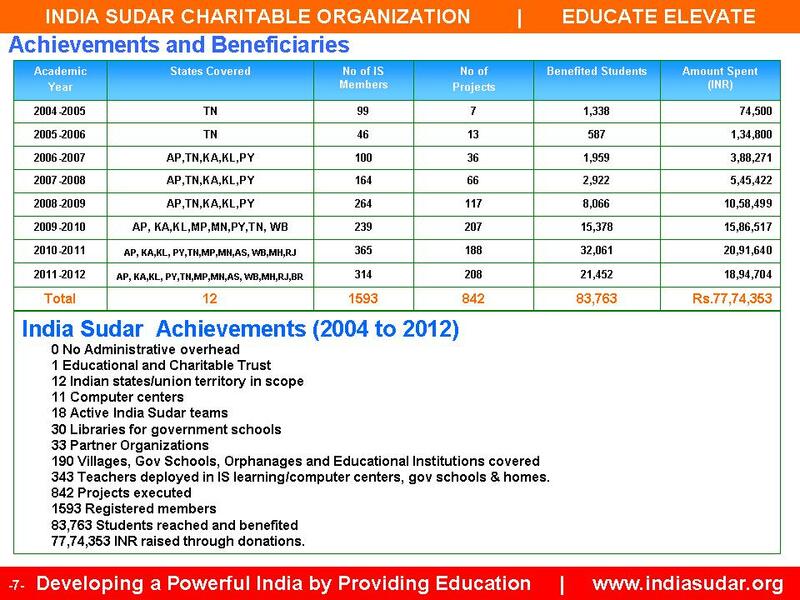 Today we completed 8 years and educated 83,763 students from 12 Indian states/ut. But no matter how small or big help we are doing to educate a needy person, but its matter of selfless service with sustainability for our Nation. I am sure, long way to go together to reach our vision. 343 Teachers deployed in IS learning/computer centers, gov schools & homes. With the sustainable support and contributions from each one of you, we step into the 9th year. It would not be possible to run a volunteer based organization for the past 8 years without YOU. Thanks to everyone and we expect the same support in the future. Today, we present a valuable gift to the society. This is the fruitful outcome of Indiasudar volunteers. The self explanatory book which consists of 60 experiments of SEBLA (Science Experimental Based Learning & Awareness) project is attached. This colorful book is published under Indiasudar Open Charity Platform Licence (IS OCPL). We permit any organization/individual to utilize the book WITHOUT any PROFIT MOTIVE. Also please find the attached file. We thank the entire team behind the preparation of book. We thank Dr T V Venkateswaran, Scientist, Vigyan Prasar, Department of Science and Technology, New Delhi for his felicitation message. A special thanks to Our member Mr.Suresh Rajan for his passion towards the design and content preparation of the book. 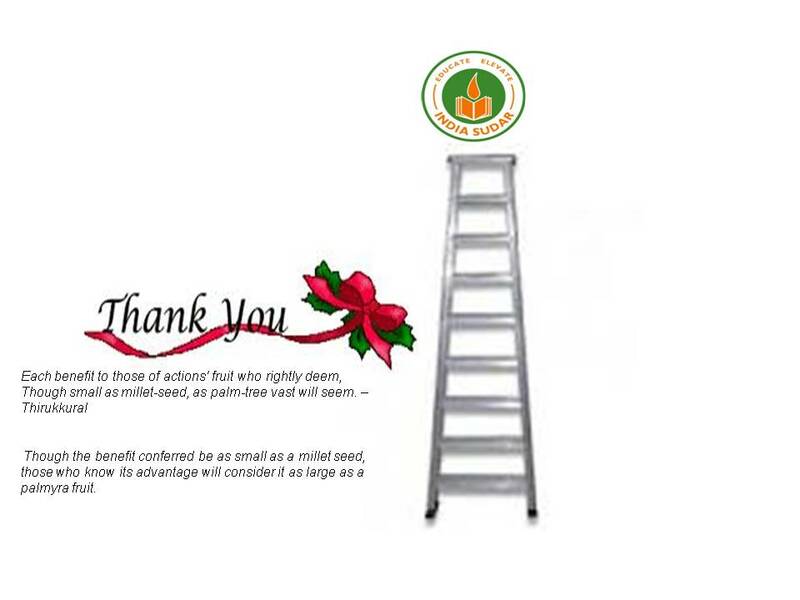 Thanks a lot for all the assistance from you to fulfill all our requirements requested by us every now and then. The same team will also publish the second edition of the book with 100 experiments and also a DVD consists of 100 experiments in 3-4 months time. standard apart from the regular courses. have their doubts get cleared. 4.Students were able to get details on the course they want to purse.